Laski Sans is a family of 20 fonts with weights finely balanced so that they can be easily combined in a wide range of environments. Its open forms and solid structure grant a high legibility on paper and on screen. The moderate, legible proportions and neutral appearance make Laski Sans especially well suited for commercial publications like marketing collateral and advertising campaigns. The type’s generally reserved tone opens up in 2 showy stencil variants – Stencil Black & Stencil Black Italic – which considerably expand Laski’s creative potential for expressive headlines. 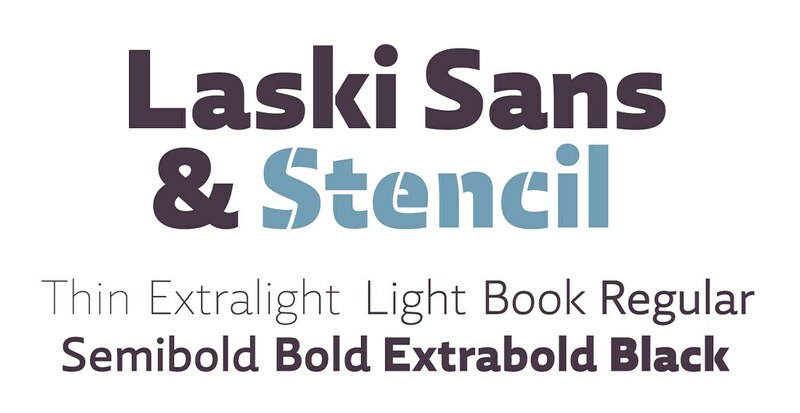 As might be expected from ReType, Laski Sans is a suite of feature-rich OpenType fonts fully equipped to tackle complex, professional typography. The character set includes small caps, fractions, alternate characters, case-sensitive forms, and 5 sets of numerals. Besides standard Latin, its extensive character set supports Central European, Baltic and Turkish languages.